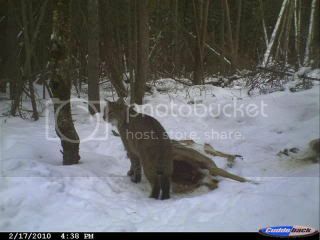 Here “Kitty kitty!” A guy (Scott) I recently met got this picture of a huge bobcat on his Cudde-back trail camera. Scott hunts coyote and bobcats during the winter months, after deer season. He hunts in a huge swamp, not far from Clare. He probably wouldn’t appreciate me getting very specific, as to where, but I was out there with him today. He uses a dying rabbit predator call, after checking the pictures left on several trail camera’s he has out. He called in two cats for a couple friends, and both were tagged. One was a nice 30 pounder and the other was a bit smaller. He said this cat would go close to 40 pounds. Scott doesn’t believe in over hunting an area so he let this big boy go, along with a couple females, that he hopes will meet up with him. When I was with Scott today I saw a couple sets of “cat” tracks, coyote tracks, but very few deer tracks. I think the deer are a little deeper in this thick swamp. Scott also showed me several pictures of bear on his cudde/back, and one is a “bruiser!” He’s hoping for a bear permit this year. They hunted last year, but couldn’t get the big smart bear to commit before dark. I shared with him a couple of the secret weapons we use on big shy bear, and he said he’d give them a try. While looking at his pictures I came across one that really caught my attention. It was a mountain lion, and I could tell the picture was taken where the other ones had been snapped. Scott said they have seen the lion on a couple different occasions (always on film) and thinks it is a juvenile. If it is momma and daddy are around somewhere. I’m going to try and get him to send me a picture of the cougar. It was a great day in the swamps and woods of Michigan, and I’m always amazed by the beauty and diversity of nature. We live in a great state! I recently got an e-mail from an old friend of mine. He reads my blogs, but I haven’t heard from him in several months. Well come to find out he’s had prostate cancer surgery, after a biopsy came back showing an aggressive cancer in his system. The Dr. thinks they got it all, but unfortunately my friend had a reaction to latex. He blistered everywhere the latex touched his body, including inside, up to his bladder! He said the pain was almost to much to bear. Urination was like hot molten metal flowing through his body according to his e-mail. Guys this is not fun, and it is a serious problem if left unchecked. I once heard that if we (men) live long enough we “Will” get prostrate cancer! We may die of something else, but we’ll have the cancer cells in our system never the less. Just two days ago I went for my annual check up with my Urologist. All men over 50 should have a Prostate-specific antigen (PSA) test done, and if your family has a prostate cancer history, 40-45 years old isn’t to soon to start. It’s a simple test done by having a blood sample taken. A little prick with a needle sure beats major surgery, chemo, pain, and leaving your family orphans. The PSA test needs to be backed up by a digital rectal exam. That’s where most guys get a little squeamish, but a moment of embarrassment, and a little pain, far outweigh the alternative. My friend, who asked me to do a blog on prostate cancer, wishes he would of started testing when he was 50. If any women are reading this please get your husbands to a urologist for this simple testing. And guys it ain’t macho to be laid up in a hospital, minus your prostate, because your to stubborn or bullheaded to have it checked out. If you want to have a good ride and stay in the saddle as long as possible, do a little preventive medicine. Your family will love you for it. You younger guys reading this make sure your dad or grandpa knows whats going on with his health. Pass this around to friends and family. You just may save a life! We’ve been waiting for a heavy wet snow all winter, and we finally got one yesterday. The reason being we needed a good packing snow so we could build a snowman. 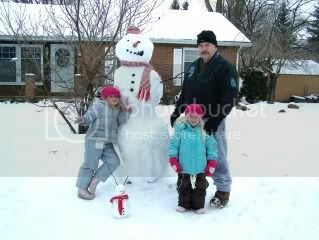 My daughter Courtney brought Ava and Addysin over early (my night to watch them) so we could build “frosty” before dinner. Courtney is a nurse, and works the midnight shift in Dearborn, so I get my grand-daughters several nights a week. It took all this “old man” has to roll that bottom snowball where it is. My legs are still sore today! We had fun lifting the second one in place, and Ava did the head by herself. Courtney has a plastic set of eye’s, buttons, carrot, etc. 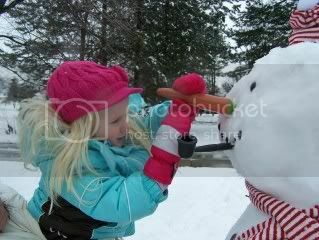 and the girls got a kick out of bringing “Frosty” alive. The first thing they both did this morning is look out the window to see if “Frosty” was still there. They remember the story about “Frosty” running away, and aren’t ready for him to leave just yet. Also yesterday we had our first snowball fight. I think it’s the first one the girls were ever involved in. We had a great time. I just had sweat bottoms on and knelt in the snow, in order to pack snowballs. In other words I was immobilized, and the girls took full advantage of it. They both clobbered me several times, much to their delight. We closed the “war” after Ava dropped a 5 pound “bomb” down the back of my neck. The hot chocolate Courtney fixed us was a fitting way to end our fun in the snow. I was starting to get a wee bit cold anyway, so old Papa was more than ready to get back in his warm house. Addy struggling to get the carrot just right. It was quite funny yesterday as the red rodent climbed along my decking, down the chain, and then tried to balance on the top of the feeder. 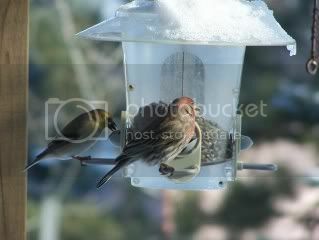 As he was swinging back and forth he tried to reach down for some seed, and flipped off into the snow. He did several somersaults before hitting the ground, and had a startled look on his face. He sat there for the longest time, as if to ponder what went wrong, with his “bank heist!” He wondered off for easier pickings, but I know he’ll be back for another try. He always does! That’s one persistent squirrel. This is one of the reasons you do alot of fishing during the summer and early fall months. 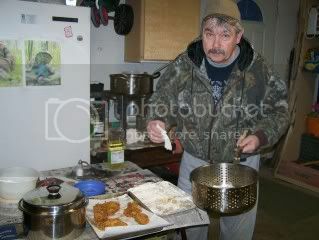 I’m frying up a mess of perch, and throwing in a package of Lake Erie Walleye for good measure. Not only fish, but I have another pan of grease going for the french fries. It’s my mothers birthday (85) and I asked her if she wanted fish and chips or turkey, mashed potatoes, dressings, vegetables, and a salad? She’s from Canada, so her response was “Give me the fish and chips!” I had two good sized packages of frozen perch and a package of walleye, and son-in-law Tony gave me a few perch, so I was all set for the “fish fry.” I pealed up about 14 big Idaho potatoes, and sliced them into french fries. I had two pots of canola oil going, which I heated to 350 degrees. The fish had been sitting in an egg and milk mixture overnight, and the flour and special seasonings were ready to go when everyone arrived at our house. I had fourteen to feed, but had already picked up a pizza for the fussy ones. It took me about 35 minutes to cook all the fish and fries, which I kept warm in the oven once done. My wife fixed a salad along with her famous sweet potato casserole, and we were ready to chow down. Mother really enjoyed herself, and the meal. We had a cake for her and of course presents, which she always gets a kick out of. I later took some pictures of her dressed up in a few of my Indian reproductions. She is 1/4 Cree and really looked like an Indian Princess to all of us. She had just been to the beauty shop the day before, and said “If you mess my hair up your paying to get it fixed!” I knew she was “kidding” (sort of) so I was careful with her hair. Our Princess on her eighty fifth birthday. The view from my coyote hunting set-up. I must of picked the wrong evening to hunt, as my son-in-law Tony has been getting trail cam photo’s of several coyotes hanging around the back of his property. Of course most pictures are from 11:00 p.m. till about 1:00 a.m. and I only stayed in the blind till around 7:30 p.m. We hung a couple goose carcasses, from late goose season, along the woodline, and I noticed they were gone. I did have some snowmobile activity not far from where I was hunting, so maybe that kept them from answering my “rabbit in distress” call. Tony said I should of been using a goose call! It’s about a 25 mile round trip from my house to Tony’s. Well last evening, after the hunt, I was talking to my wife’s brother Pat, and he’s been seeing “yotes” behind his house again. Pat only lives around the corner from me. I guess I need to pack up my stuff from Tony’s and bring it in here closer to home. I forgot to mention my Cabela’s ground blind had blown over and one of the fiber-glass poles was broken. Last year I had one in the same area, and the wind blew it out of the County. Honestly we never found it after an evening of high winds. They put those guide ropes on the blind corners for a reason, and it’s not to tie them to a flimsy bush! (Like me!) It still works, but the back section is a little weak. So sometime this week I think I’ll be moving my operation closer to my own back yard. I know their out there. It’s just a matter of perseverance. Hey Art this is what you have to look forward to. As many of my readers know I watch my grandkids several days a week. Some days my wife and I get them ready for school, and I drop them off. On other days I have 3 year old Addysin and 4 year old Kyle stay at the house with me. Sometimes “old” Papa gets a bit tired throughout the day, and he’s been known to take a “snooze!” I mean after the umpteenth time of watching “Little Bear” reruns my eyes start to get heavy, and my head starts to move toward my chest. This isn’t always a great idea when your watching two active preschoolers. One day, a few weeks ago, I had my buddy (little Addy) and dozed off, for just a second! At least it didn’t seem like very long. When I awoke I found my fashion princess had decided to dress up. Wow! I was blown away by her ability to co-ordinate her cloths. She’s defiantly a chip off the old block. 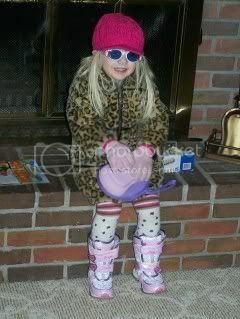 Why if I did’nt know better, I would of thought that I dressed her. We now have a deal, that if Papa nods they can wake me. They get a big kick out of this, cause they usually “scare” the crap out of me when they yell in my bad ear, or (whats worse) jump on my lap. That alone is incentive to watch one more episode of “Little Bear!” All in all it’s a great age for kids (and grand-kids) and I most always enjoy my time with them. Art I know your already having a blast with your daughter, but it’s going to get better, so stay awake and enjoy your princess. Time goes way to fast, and we can’t go back and do it over. Same goes for you Tom Sorenson with your little guy. It won’t be long and you’ll have a sidekick for all those “base camp” adventures. He sure looks like a happy kid. Time to check on my two little sleeping pals. I’ve learned to lay them down for a nap, and then Grandpa can sneak in a few “legal” minutes, without fear of a knee to the midsection. Pleasant dreams. All I can say is “Wow!” The smiling hunter is Brian Stephens posing with the Southwest Ohio buck he shot during muzzleloader season. It’s an 18 point non-typical, and is the new Ohio state muzzleloader record. He shot it on Nov. 30th. which is the opening day of Ohio’s shotgun season. Muzzleloaders are legal to use during this hunt. 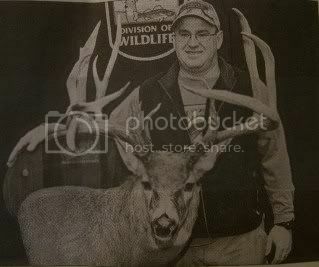 After the mandatory drying period the buck was officially scored at 232-5/8 points. That beats the old record by almost 8 full points. The Stephens buck has a left main beam that measures 35-1/8 inches, which is the longest ever recorded under the Boone and Crockett scoring system. The right beam measured 34-1/8 inches on this impressive Ohio monster. This is a world class whitetail that actually came from a county (Highland) that is not as well know as some of the Southeastern Ohio (big buck) counties. Everyone agrees that it’s not something in the water that is producing large bucks from Southern Ohio. “You have to have good genetics, good food sources, and let them get old enough to produce a deer like this,” said Todd Haines, an Ohio Wildlife manager. I’d probably drop dead from a heart attack if I saw something in the woods like that. I never read what the G-2’s or G-3’s measured, but they look to be every bit of 13-15 inches. You might even think “I can’t shoot that, I don’t have an elk permit!” Anyway my congratulations to Brian for his well placed shot, and for being in the right place at the right time. That is one beautiful buck! Last Minute Squirrel, The Hard Way! 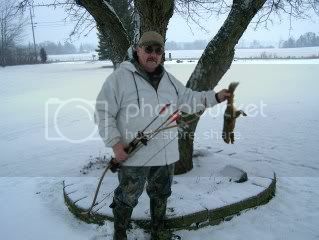 Anyone who has ever tried to sneak up on a squirrel with a recurve (longbow) knows he has to get close. In my case very close. I had taken two shots from about 20 yards, and missed, losing one of my arrows. The snow was “crunchy” making for a slow tedious stalk. There were many squirrels in the woods, but they weren’t exactly cooperating with my game plan. I finally saw one going into a hole, at the base, of a dead tree. He would come out every so often to look for something to take to his nest. I moved within 8 yards while he was inside the tree. The first time he came out I missed clean, and spooked him back inside for a least 20 minutes. I figured this was my best chance to get a year end Fox squirrel, so I stayed put. When he finally came out again he went under a dead tree before I could draw. He was partially hidden by a big limb, but I could see his body, so I let one fly. Bingo, a squirrel for the roaster! There isn’t much meat on one of these little varmints, but I’m sure no one will be fighting me over the “spoils” from the roasting pan anyway! In my time in the woods I saw plenty of squirrels and squirrel tracks, but not one set of rabbit tracks. This is traditionally a rabbit haven. However I did see several sets of coyote tracks. Could be why the rabbits are disappearing. 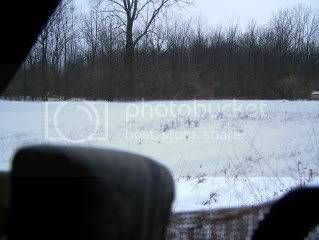 I decided to set up my pop-up ground blind on the edge of a small opening, where there was a lot of “yote” activity. I’ll give them a few days to get used to it, pray for snow, then see if I can’t get one within 22 mag. range. 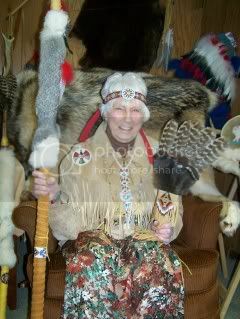 This is my mother Betty Louise Ansel (Greer) who hails from Sault St. Marie Canada. Her and my dad Norm raised six (6) boys. She has 19 grand-children and 31 great grand-children. I guess that’s why we all affectionately call her “Grannie.” She’s fast approaching the mid-eighty mark on the calendar, and has been without “Papa Bear” (my dad) for almost 32 years. She lives independently, and still drives her little red neon once a week to the beauty shop, where the girls all adore her. Her snow white hair is “what you see is what you get!” No color highlights here. Her dad Kelly also had snow white hair. As you can see from the pictures mom inherited the high cheekbones from her grandmother (Plains Cree) but got the white hair from her Irish Dad. She had gorgeous auburn hair when she was younger. She never knew her Indian grandmother, as she died very young, and her mother passed away when my mother was just three years old. She was raised by her fathers mother (her grandmother) and never experienced a mother/daughter relationship. Her grandma was “old school” and her dad was busy trying to keep his large family afloat. Mom’s brothers and sister were raised by various family members, so even the sibling aspect of childhood was splintered. Mom has a great outgoing personality, and never met a stranger. 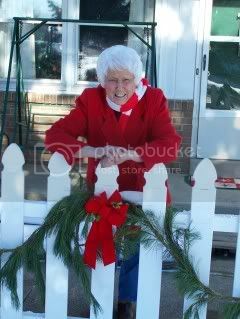 Her zest for life, and love for people, has kept her smiling throughout the years. If you check out the lights shining in mothers window, you’ll see her Christmas tree is still standing! Thank God it’s artificial, cause it has another two months to go. However, there was a day when we would haul out her real tree, to the garbage, without a needle on it. She loves Christmas and she loves her Christmas trees. She also is a totally “wacko,” over the top, hockey nut. She’s a tried and true Red Wing fan, and never misses a game. In fact we avoid visiting when we know a game is being televised. She has a lot of “kin” and many friends, but one in particular has met her every need. My mom, even though she is a “squaw,” has been a warrior in the Kingdom of God for many decades. she is a women of prayer, and has intimate conversations with her Lord and Savior. God has heard her plea on many occasions, as miracles surround her prayers. She is an example to her seventy six children, grandchildren, and great grandchildren. She still comforts us all, and defends us like a “mother bear” even when were wrong. She is a virtuous woman and we (her family) are truly blessed to call her Mom, Grannie, and Gigi.